Greetings of the season to you all. It has been a while between newsletters and we are grateful to you for your patience. The Friends of the Dorothy Neal White Collection 2013 AGM was held on Tuesday 21 May 2013 at the National Library. An apology was received from President, Emma MacDonald, so the meeting was chaired by Joan McCracken, which was attended by 23 members and friends. This was a significant meeting as this was our 30th year (the Friends were formed in 1983) and four of our long-serving committee members stepped down. Between them Emma MacDonald, Alison Grant, Mary Hutton and Lynne Jackett have served the society for over 80 years (with Mary on the committee since the Friends were formed) and they’ve held several positions. Their contribution was warmly acknowledged by the meeting, and copies of Swim: the story of Hinemoa and Tūtānekai by our guest Chris Szekely were promised (the meeting was held before the book was published). As a consequence we do not have a president or official secretary for the Friends of the Dorothy Neal White Collection. As an interim measure, until a President is nominated, the three National Library staff members will share the administrative responsibilities of the President (Joan McCracken to chair meetings, Mary Skarott and Corrina Gordon to prepare agendas and minutes). As it would be inappropriate for a staff member to undertake an advocacy role, Janet Blake has agreed to accept that responsibility. A need for a new patron was also voiced following the death of our patron Margaret Mahy. If anyone is interested in joining the committee to fill one of the missing positions we would love to hear from you. At the meeting members discussed ways of increasing membership and the disruption caused by moving back into the newly refurbished library was acknowledged. The committee was asked to investigate options for promoting the Friends more widely and attracting new members. Following the AGM Chris Szekely gave a presentation about his forthcoming book Swim: the story of Hinemoa and Tūtānekai to be published by Huia. Chris spoke of the background to his re-telling of this famous story and then read it to a very receptive audience. The lyrical text is supported by equally beautiful illustrations by Andrew Burdan. We are sure many New Zealand children will find this under the Christmas tree this year. Our event on 22 August 2013 was held in the Tiakiwai Room of the National Library building. Bringwonder the Storyteller entertained with Celtic tales, mainly Scottish, to celebrate his family roots. August is Family History month so the focus on family history was very appropriate. Bringwonder is New Zealand’s first professional storyteller with over 30 years of experience, both here and overseas, drawing inspiration from a wide range of cultures and topics. He is based in the North, but travels extensively taking his stories to schools and community groups. The audience, which included his daughter and granddaughter, responded warmly. For our recent event on 4 December 2013, we were delighted to have Tania Connelly, who has re-joined our committee this year, speaking to us about her self-published book, Over the hill to Greytown. Tania shared her experiences of self publishing a book and the tremendous local support she received. The story is based on a historic figure, Samuel Oates, originally from Derbyshire, who allegedly brought some gum saplings in a wheelbarrow, to the town that is now known as Greytown. Written in a very nursery rhyme style and beautifully illustrated by Viv Walker, this book is will certainly be found under a few Christmas trees this year. The inspiration for writing this book came to Tania when she was thinking of giving a book to her four-year-old grand-daughter about the local area and could not find anything appropriate, so she had the wonderful idea of filling a niche. The book has been so well received by locals that a second printing has been arranged. Well done Tania! I am a total Christmas addict so when I saw this book come through the National Library new acquisitions I pounced on it. It is a delight of a book. If it were a person I’d hug them. Written by Birdie Black and published through Nosy Crow, it is a story about finding and giving just the right present for someone, not the most expensive or the glitziest, but a present from the heart. It is also a story about creating things rather than buying and in a way recycling. A king finds a bolt of beautiful red cloth in the marketplace and buys it to make a Christmas cloak for the princess. When the cloak is finished the scraps of material are left on the doorstep. The next person finds them and takes them to make a present for her mother leaving the scraps on the doorstep once more. The story goes on with each person or creature leaving the remnants of material for the next one to find, just right to make their present for their own loved one, until the last tiny wisp of red material is used by a mouse to make a scarf for her little boy “Billy”. The story finishes with the opening of each present on Christmas day and the obvious pleasure of both the givers and recipients. The book is illustrated by Rosalind Beardshaw, who has previously illustrated Daddy’s little scout and Mommy’s little star. With expressive and vibrant images, Rosalind has brought warmth and joyous activity to this charming story. In this age of over-commercialised Christmases this is inspiring and encapsulates the magical feeling of Christmas that, as the Grinch would say “doesn’t come from a store”. The Dorothy Neal White Collection and I have had a ‘thing’ going for many years. When I was writing my MLIS thesis, I spent hours browsing the shelves, entranced by the voices of long-gone authors and the characters they created. In 2001, I was honoured to be the first recipient of the ‘Friends’ scholarship and became a ‘Friend’ myself, not only to show my gratitude for the distinction but to continue my association with the band of books that had so captured my interest. I was a member, a committee person, even a president at various times. Membership was fun. On one occasion I made a mountain of pink lamingtons for some literary celebration or other, only to sit on them on the crowded Johnsonville train! Another time I tried to give a humorous talk about my late mother’s ninety year old teddy bear, but reduced myself and a good part of the audience, to tears in the process! But there was another reason why I liked being a ‘Friend’, ever since I can remember I have been interested in children’s books. As a child this was perfectly appropriate but as I grew older, and failed to put away what was generally considered childish reading material, people thought me distinctly odd. My children eventually outgrew me when it came to books and even my five year old granddaughter, though prepared to tolerate Angelina Ballerina for the present, tells me she plans to dump the dancing mouse at her next birthday, in favour of ‘something more grown-up!’ The ‘Friends’, however, shared my idiosyncratic tastes. Well balanced, discerning individuals, with a great sense of humour, they viewed juvenile literature, not merely as ‘kids’ books’ but as an art form, equal to adult literature and just as deserving of serious study. This alone made membership worthwhile – as did the stunning sandwiches at meetings but that is another story! So when I heard that several long-standing members of the ‘Friends’ committee were stepping down and new nominations were being called for, I didn’t have to think twice about standing again. It may well be sad and a sign of ageing or of sheer impracticality seeing that Wellington is 75 km distant, over a steep hill and I don’t drive, but I have done it anyway! Thank you for having me back! Esteemed children’s book editor, publisher, and author Charlotte Zolotow, whose written works are lauded for their warmth and their realistic portrayals of childhood emotion, died Tuesday, November 19, at her home in Hastings-on-Hudson, N.Y. She was 98. Zolotow was born Charlotte Shapiro in Norfolk, Va., in 1915. As a shy and awkward child whose family frequently moved, she has said that she found writing easier than talking. She won her first award for essay writing in the third grade, and seemed to have found a lifelong calling. In the early 1930s, Zolotow attended the University of Wisconsin-Madison on a writing scholarship. While there, Zolotow met fellow student and aspiring writer Maurice Zolotow. The couple married in 1938 and settled in New York City where they had two children, son Stephen (Zee) and daughter Ellen, who later changed her name to Crescent Dragonwagon and is also an author. Also in 1938, Zolotow began a secretarial position at Harper & Brothers. She soon became editorial assistant to (and protégé of) legendary children’s book editor Ursula Nordstrom. Zolotow built a venerable decades-long career at Harper, moving up through the ranks to become v-p and associate publisher of the children’s division and later was given her own eponymous imprint. She retired in 1991 and was given the title of publisher emeritus. With Nordstrom’s encouragement Zolotow wrote her first picture book, The Park Book, illustrated by H.A. Rey, in 1944. She went on to create more than 90 titles for children, including Mr. Rabbit and the Lovely Present, illustrated by Maurice Sendak, which was named a Caldecott Honor Book in 1963; and William’s Doll illustrated by William Pène du Bois, a 1972 book considered controversial because it features a boy who wants a doll. During her tenure as an editor, Zolotow worked with such noted authors as Patricia MacLachlan, Francesca Lia Block, Paul Fleischman, Paul Zindel, M.E. Kerr, and John Steptoe. She was honored in 1998 when the Cooperative Children’s Book Center at the University of Wisconsin-Madison established the Charlotte Zolotow Award, an annual prize for the best picture book text published in the U.S. Additionally in 1998, the CCBC initiated the Charlotte Zolotow Lecture, which has been presented by Katherine Paterson, Judy Blume, and the late Jean Craighead George, among other distinguished authors. It is with sadness we acknowledge the death of artist and illustrator Alan Gilderdale on 12 December 2013. This obituary is from the Scholastic website. 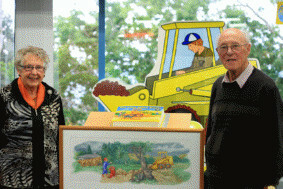 Alan Gilderdale, perhaps best known as the illustrator of the Little Yellow Digger books, passed away peacefully on December 12th after some months of deteriorating health. He was 89 years old. As the illustrator of the Digger series, his work is found in well over three hundred thousand homes, and a generation of New Zealand children have grown up with it. However his life had many other aspects to it. Alan Gilderdale was born and grew up in York, England. He quickly developed a talent for art and attended London University’s Slade School of Art briefly, before being called up for military service in 1942. As a conscientious objector on religious grounds, he undertook his war service with the Friends’ Ambulance Unit, latterly in Italy. After the war he returned to the Slade and completed his degree. It was there that he met his future wife, Betty, and they married in 1949. For the next eighteen years, he worked as a lecturer, first at St Martin’s School of Art in London, and then Reigate School of Art in Surrey, whilst exhibiting his work, amongst other places, with the London Group. He was also active in the founding of the Campaign for Nuclear Disarmament and was arrested during a sit-down anti-nuclear protest. The family came to New Zealand in 1967 to teach at the Friends School in Wanganui, before moving to Auckland in 1969. There he taught at Ardmore Teachers’ College, the Kindergarten Teachers’ College and the Auckland Technical Institute (now AUT), but increasingly concentrated on working as an artist. He exhibited primarily with the New Vision Gallery, but was also well known for the lithographic work he produced with Muka Studio. He won the Pump House Awards in 1985, and the ASA’s Bledisloe Medal in 1989. His work is found in a number of leading collections, most notably the James Wallace, Fletcher and Goodman collections. Despite critical acclaim, Alan’s modest nature meant that exhibiting and self-promotion were anathema to him. Consequently his artwork, which tended towards Jungian inspired mythological themes, remains relatively unknown. It was his illustration, most notably for the Kotare series and then the Little Yellow Digger series, which brought his work to wider public attention, and has meant that his art is a much-loved part of many young New Zealanders’ early experience. He frequently worked in partnership with his wife of 64 years, Betty, whom he assisted in founding the New Zealand Children’s Literature Association, and whose books he illustrated. Although professionally an artist, he was highly active in the Peace movement and was one of the founder members of the New Zealand Foundation for Peace Studies, which made him an honorary Life Member in 2011. He was a lifelong Quaker and served as an Elder for many years within Auckland and North Shore Meetings of the Society of Friends. Alan Gilderdale is survived by his wife Betty, three children, six grandchildren and two great‐ grandchildren. Have you ever read an Animal Biography? One of the most recent donations to the Dorothy Neal White Collection was a copy of Johnny Bear: and other stories from Lives of the hunted / by Ernest Thompson Seton, dating from around 1925. We already had one rebound copy, but the most recent addition has retained its original binding. As well as Johnny Bear, the book includes Tito: the story of the coyote that learned how, and Why the chickadee goes crazy once a year. Ernest Thompson Seton lived a life dedicated in large part to learning about the natural world, and he spent some time as Naturalist to the Government of Manitoba, Canada. As well as being a naturalist and wildlife artist he was a best selling author of animal stories. His first, and probably best known collection of stories, is Wild animals I have known, first published in 1898. The challenge for any writer of animal stories is to maintain a sense of verisimilitude, that is, to depict the animal experience of the world in a believable way. Seton’s work is generally very successful in this respect. Although he uses a first person human narrator, the animal characters take centre stage and the action is largely focused through their experiences. He based his stories on his own observations of the animal world, but goes beyond simply describing what he saw. As part of his examination of the character and personality of each animal the author includes his own interpretations of their thoughts and feelings, so adding a fictional element to the factual narrative; his animal stories, then, lie somewhere between fiction and non-fiction. The DNW Collection includes a total of nine books by Ernest Thompson Seton, published between 1905 and 1929. Ernest Thompson Seton (1860-1946)For more information about the life and work of Ernest Thompson Seton, visit: http://etsetoninstitute.org/sample-page/ The site includes a comprehensive list of his works, and links to those works which have been digitized or which are available to read online. Hunt, Violet. The cat. London: Adam and Charles Black, 1905. (Animal autobiographies series) A pedigree Persian house cat recounts day to day domestic events in her well-to-do home, including catching her first mouse and being taken on holiday to Paris! James, Will. Smoky the cow horse. New York: Charles Scribner’s sons, 1926. In similar vein to Black Beauty, but with a human narrator. Follows the life and adventures of an American cowboy’s horse, set in the early twentieth century. Winner of the 1927 Newbery Medal. Paget, Francis Edward. The owlet of Owlstone Edge: his travels, his experience and his incubrations. London: Published by Joseph Masters, 1857. A church dwelling owl provides large amounts of Christian guidance for the reader. Sewell, Anna. Black Beauty. First published 1877, various editions in both DNW and NCC collections. A much loved book set in nineteenth century England in which a horse tells of his experiences at the hands of both good and bad masters. It is 150 years since Geneva Grace Stratton was born in Wabash County, Indiana. I am sure that for all of us there are books that make a particular impact. When I was young I was in the fortunate position of having a mother who not only shared the books I was borrowing from the library, but also the most loved books from her youth. Among them were a treasured collection of titles by Gene Stratton Porter that Mum had kept with her over many changes of house and circumstance. I read – and re-read them all. Girl of the Limberlost, Freckles and Laddie were all favourites, but the one I loved the most was The Harvester (first published in 1911). As with all her novels it is the woods and birds around her home that inspired much of the story (at this time Gene and her husband Charles Porter were living in the “Limberlost Cabin” near the Limberlost Swamp). I was somewhat amused to read this outline of The Harvester on a website: “Gene Stratton-Porter returns us to her beloved Midwestern woodlands with a hero modelled after Henry David Thoreau. He and his “wonderful, alluring” Ruth ultimately find idyllic bliss in the pure, unspoiled woods, but not before her mysterious past is revealed and resolved.” Not quite my words but I guess it covers the basics! The “sunshine room with the golden garden” that The Harvester builds for his Ruth remains something to which I aspire (though, I regret, not in any practical way). The Dorothy Neal White Collection holds early editions of many of Gene Stratton-Porter’s works, as well as later reprints, and a biography The lady of the Limberlost by her daughter Jeanette Porter Meehan (1928) is in the National Library collection. Tina Matthews was presented with the Russell Clark Medal for Illustration at the LIANZA Children’s Book Awards ceremony in Wellington on Monday night for her picture book A Great Cake. A Great Cake tells the story of young Harvey who learns a few lessons along the way as he eventually makes his perfect cake, which features at a big picnic beautifully depicted in the book on a double page spread. Pene Walsh, Awards Convenor and Gisborne Library Manager, said we can safely say Tina Matthews is no longer an emerging artist, she is clearly at a high point in her book making. “Matthews’ wood cuts and stencils are expertly used in a Japanese-esque style and layers and layers of colour and texture build to create the final illustration”. “A visually inviting cover is the initial link from picture, to story, to words, and the explosion of imaginative synapses in between”. Ms Walsh said the high standard of entries for this category, from five different publishers, indicates illustrated books for children remains a solid market. The Judges were also delighted with the calibre of junior fiction writing offered for the Esther Glen Medal, New Zealand’s oldest running book prize. The finalists’ covered a variety of themes that delight, challenge and inspire with some immersing readers in New Zealand’s rich historical past – particularly fitting as Esther Glen herself had a keen interest in history. There was a noticeable theme of tackling true to life teenage issues running through the LIANZA Young Adult category and winning title The Nature of Ash by Mandy Hager, combines all the ingredients that teens will enjoy reading for years to come.Hager’s novel was a stand-out for all three judges who loved the richness of this multi-layered storyline and the way Hager manages to weave all the themes together so perfectly. “The strong and extremely well-developed characters, along with the dystopian theme, formed an action-packed story that in many ways reflects the current issues facing humankind today”. At the Beach: Explore & Discover the New Zealand Seashore by Ned Barraud and Gillian Candler was awarded the Elsie Locke medal for non-fiction and the judges clearly see a place for this book in schools, libraries and homes.“It is a hot-chocolate-table book for not only the child who loves facts but the one who love quirky stuff and stories. It is a book for browsing”. Ko Meru by Kyle Mewburn, illustrated by Ali Teo and John O’Reilly, translated by Ngaere Roberts is the winner of Te Kura Pounamu Award, for a distinguished contribution to literature written in Te Reo Māori.Te Rangi Rangi Tangohau, Te Kura Pounamu Panel Convenor, says children will immediately be drawn into the story because of the simplicity of a lonely mule gazing into the sky dreaming of something new. “It is a humorous read with simple and colourful illustrations that will appeal to young readers”. “The friendly use of onomatopoeia works well with children and the descriptive and repetitive language will happily guide the reader to patu-patupatu, kiriti=karati, takahi-takatakahi through the story. In a closely contested race, librarians across the country voted for their favourite title from the list of finalists for the 2013 Librarians’ Choice Award. Fan-favourite was My Brother’s War by David Hill, a Young Adult novel incorporating issues of civil rights, war, politics, discrimination and moral integrity into a well written and powerful story that had obvious appeal to the library profession.Walsh said “we are very proud to present the Librarians’ Choice Award; although a fairly new addition to the awards it is an important koha from our profession, one that says this is New Zealand librarians’ favourite children’s book of the year”. The awards, encompassing New Zealand’s longest running book prize, celebrate excellence in children’s books and the unique contribution New Zealand children’s authors and illustrators have made to building national identity and cultural heritage. The awards are organised by LIANZA (the New Zealand Library Association) and are uniquely judged by a panel of librarians, showcasing the knowledge and expertise of the library and information profession.